A recent Wisconsin Court of Appeals decision recommended for publication contradicts long-held beliefs regarding the ability of parties to contract for determination of child issues outside of the court system. In Lawrence v. Lawrence, No. 03-1699 (Wis. Ct. App. Aug. 19, 2004) (recommended for publication) the District IV court of appeals affirmed the order of Dane County Circuit Court Judge Maryann Sumi that denied review of the guardian ad litem and family court counselor’s joint determination as to choice of school, where the parties previously authorized them to rule on that issue. Subsequently, the parties had a disagreement about school choice and the GAL and family court counselor “ruled” in favor of the father’s choice of school. Thereafter, the mother moved for an order regarding which school Desmond should attend. The trial court denied the mother’s motion, finding that there is no provision in the partial marital settlement agreement for judicial review of the GAL’s and family court counselor’s “ruling.” Instead, the trial court held that any modification to this arbitration-like provision would have to occur via a Wis. Stat. § 767.325 modification motion. Luann appealed and the court of appeals affirmed in an opinion written by Judge Margaret Vergeront. The mother argued that giving the GAL and family court counselor this exclusive impasse braking authority is not authorized by statute and contravenes public policy, as it is a de facto abdication of the court’s authority concerning matters relating to minor children and transfers that authority to third parties. 1) Herrell v. Herrell, 144 Wis.2d 479 (1988), held that the statutory burden on custody modification that is stricter than that set forth in agreement supersedes. In Lawrence, the court reminded that the GAL and counselor are not determining which party has custody, but rather are solely impasse-breaking after both parents have had an opportunity to exercise their right to make major decisions. 2) Biel v. Biel, 114 Wis.2d 131 (1983), held that the court must make custody and placement determinations, and cannot delegate those decisions to an arbitrator. In Lawrence, however, the court did not equate third party impasse-breaking on choice of school to determining custody. 3) Ondrasek v. Tenneson, 158 Wis.2d 690 (1990), which held that an unmodifiable ceiling on child support is against public policy. In Lawrence, court concluded trial court is not deprived of any authority it otherwise would have had. Additionally, the court heavily relied upon the public policy which strongly encourages settlement of divorce cases. In some ways, the decision makes perfect sense. As the appellate court notes, there is no reason to believe why having a court resolve a dispute is preferable than having it resolved by the GAL and social worker. In fact, an argument can easily be made that it would be preferable not to have a decision made by the court as court calendars and the time necessitated by the formal presentation of evidence can cause havoc when a quick decision, such as choice of school, needs to be made. Also, the GAL and social worker typically know the child and parent better than the court. The appellate court is also correct that use of third parties will promote settlement, as naming a third-party tiebreaker is an attractive incentive to a parent afraid to settle and face the costs and inconvenience of future court actions. The troubling issue is the continuing confusion among Wisconsin courts regarding the extent of their powers. As stated before in my column”Court of Equity – or Not?“, some appellate cases have held that family courts are court of equity and thus, have broad discretion. Other cases have held that family courts have only those powers conferred upon them by statute. The Wisconsin Supreme Court recently decided Franke v. Franke, 2004 WI 8, 268 Wis. 2d 360, 674 N.W.2d 832, holding that a circuit court may relieve a party from property division provisions of a divorce judgment under Wis. Stat. §806.07 even though the divorce judgment incorporates a confirmed arbitral award. The sense of the decision was that circuit courts always have supervisory powers over agreements of the parties. If that is true for property division, given the importance of protecting children, it must assume to also be applicable for custody and placement issues. This is not to say that the result in Lawrence was not an appropriate one. As stated above, such a holding would be a help to resolving some difficult placement and custody issues. 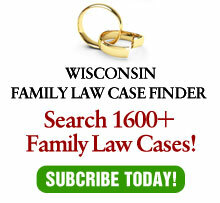 The decision, however, is difficult to place into a consistent framework regarding the powers of Wisconsin family law courts and the ability of the parties to stipulate to restrict these powers.